The prairie breaks first into miles of gentle hills, bright green in plush summertime growth. The hills then transform almost abruptly into the rugged Badlands, bluffs and valleys stark with blues and greys. As the land unfolds before this explorer’s eyes, so does the story of the American cowboy. 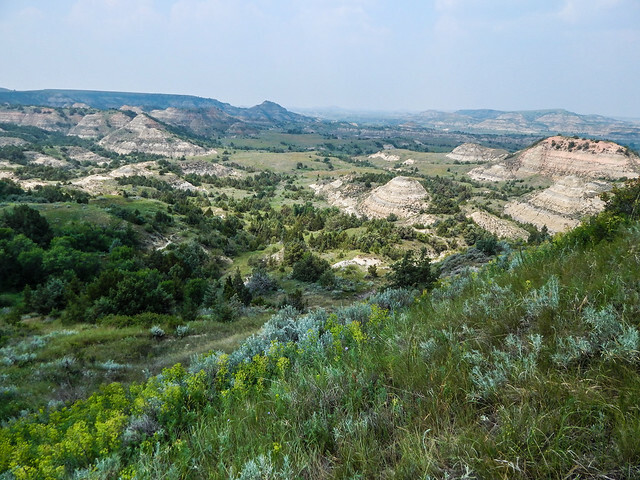 This story, a vital part of America’s past and present, is preserved in a little gem tucked into the southwestern corner of North Dakota: Medora. 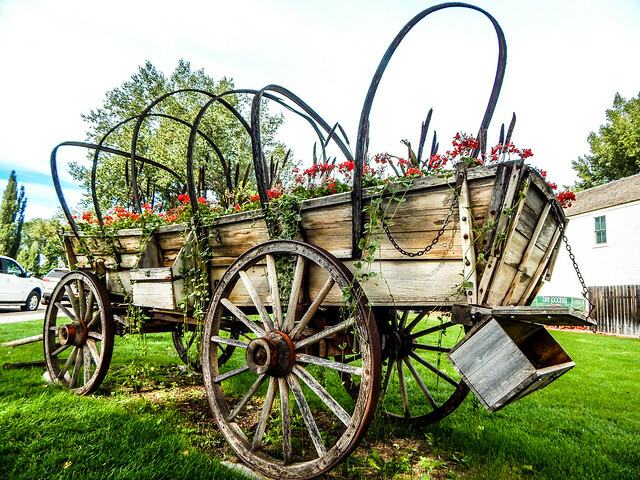 History is deeply embedded within Medora, from its historical buildings to the occasional costumed cowboy walking the streets and sharing a story. To fully enjoy my trip, I learned about the history of the town. French aristocrat, Marquis de Mores came to the area in 1883 with the idea of raising cattle and building a meat packing plant that would ship out processed beef on refrigerated train cars. He bought 44,500 acres of land on which to raise his cattle. Along with his packing plant, he built a home and opened a stagecoach business. His home overlooked a budding small town, which he named Medora after his wife. De Mores became famous in the west not only for his cattle operation and revolutionary idea of shipping processed beef on refrigerated cars, but for his skills as a gunslinger as well. Cattle and horse rustling was fairly common in the Badlands at that time and more than once, he found himself in a duel with someone who had wronged him. Difficulties in the beef business began to take their toll on de Mores after just a few years, but it was the weather that finally did his business in. North Dakota is known for especially harsh winters, and that was the case in the winter of 1885-1886. Blizzards killed off much of the cattle herd, leaving de Mores with very little. He and his wife left the town soon after. 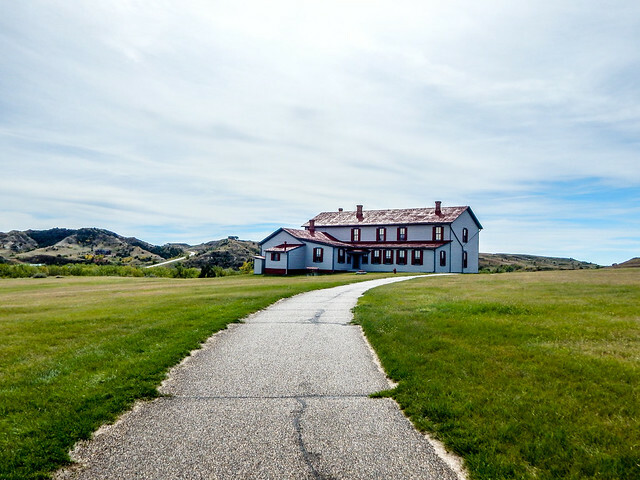 However, with some help from President Theodore Roosevelt and his passion for the North Dakota wilderness, the town and its treasures remain today. You can learn more about the life of de Mores and his wife Medora by visiting their home, Chateau de Mores. The home is restored to its 1885 condition, complete with original furnishings. The home sits perched on a hill overlooking the town on one side, and a vast, beautiful expanse on the other. While the home is a treasure trove of history, it’s worth seeing it just for the stunning surroundings. Everything was still and quiet the morning I visited, and I had the impression it’s like that often. I spotted three deer playing in the distance and wondered how often Medora herself stood in that spot looking for wildlife. She was an avid hunter, so she likely would have spotted much more than did my untrained eyes. Inside the home, I learned about everything from the 1880’s bathroom to a nifty little device called a bug sprayer. When I asked about the little metal box, the tour guide laughed and explained it was a common way of banishing bed bugs from the mattresses. Yes, the tour guides really do know about everything in the home. The chateau is open seven days a week during the summer season. Admission prices vary by age and time of year. 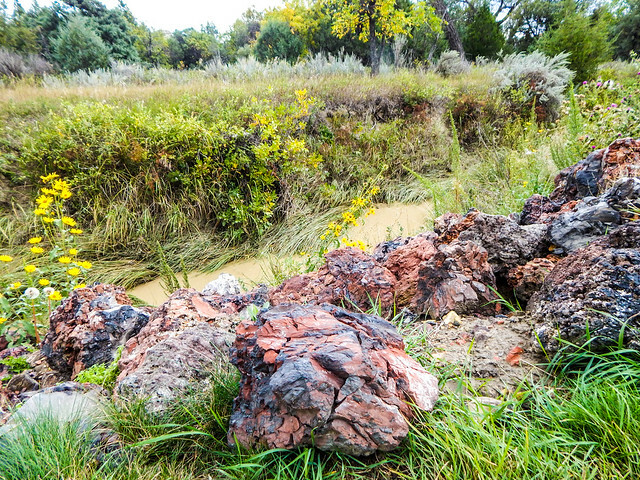 Medora largely owes its resilience to the 26th President of the United States, Theodore Roosevelt. 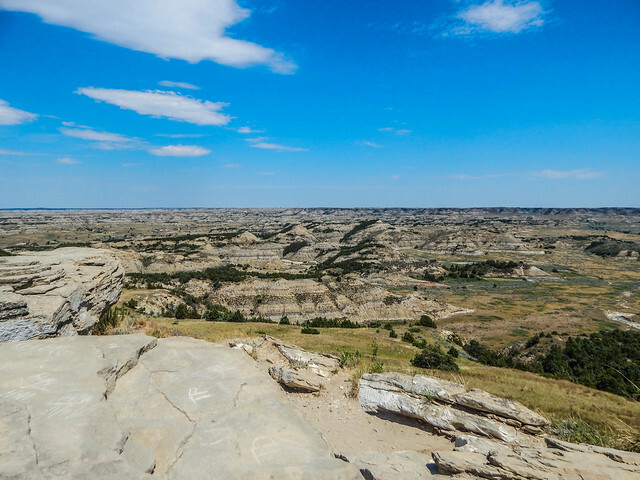 Roosevelt once said of North Dakota, “It was here that the romance of my life began.” Gazing upon the dramatic landscapes of the Badlands, it is easy to see why. Medora holds the entrance to the Theodore Roosevelt National Park South Unit. 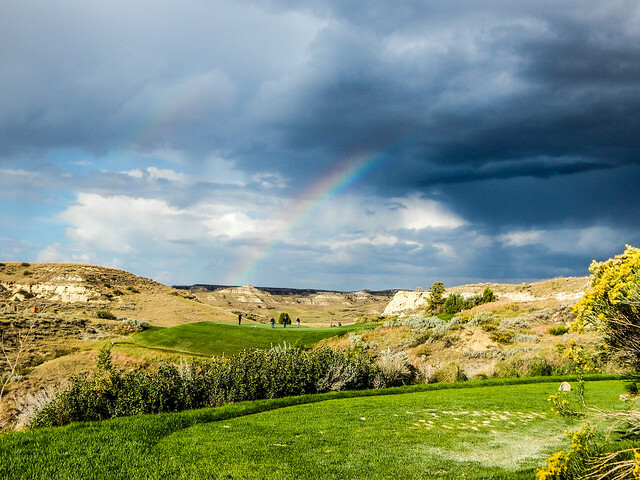 This easy loop drive includes one of a kind views of the Badlands and the wildlife within. It is common to spot bison sunning themselves on a lazy afternoon, or to stumble upon a prairie dog town that is chirping with activity. A photographer’s delight, the Theodore Roosevelt National Park offers the opportunity to explore the ruggedness that the 26th President said changed his life. I enjoyed a leisurely drive through the park, stopping often for photos of buffalo, prairie dogs, and the amazing view. I’ve had the privilege to see much of the United States, but nothing has compared to the Badlands. The muted grays, blues and greens are soft and in stark contrast to the strong brick-red stripes running through the rock. Coarse hills pierce through the prairie, creating dramatic ranges and canyons as far as the eye can see. Even the air is different here from other landscapes I’ve explored. It’s fresh, but tinged with sage and the slightest musk that I couldn’t quite catch. The air and the view are nearly intoxicating for those who love exploring the dramatic beauty of nature. I drank up as much of it as I could before continuing down the curving road back to town. Following the afternoon trip through the national park, I am ready for Medora’s premiere dining experience: The Pitchfork Steak Fondue. Dressed in true western wear, my blue jeans and boots, I head up to the Tjaden Terrace. A crowd is gathered to watch as ribeye steaks are done in a “western-style” fondue – stacked on a pitchfork and dipped into steaming oil. As we enjoy the steak, buffet, and striking scenery, members of the Medora Musical provide entertainment as a warm-up to the nightly musical show. 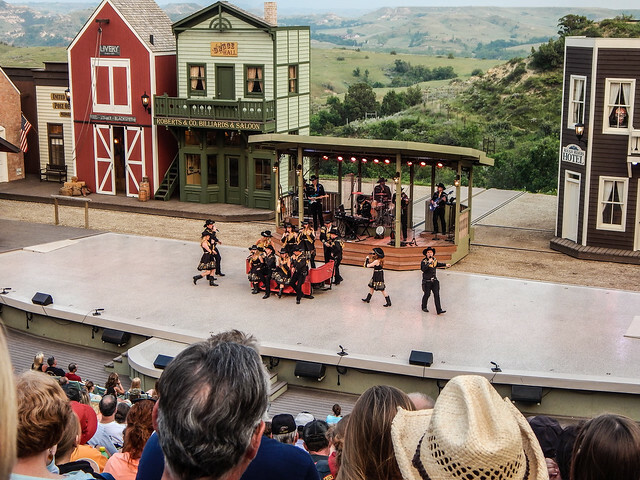 The Medora Musical is billed as “the rootin’-tootinest, boot-scootinest show in all the west”, and that is really the best way to describe it. The crowd moves from the dinner area to the outdoor amphitheater for a show filled with singing, dancing, costume changes, and guest entertainers. There is a strong theme of American patriotism and a passion for the area’s history woven into the show. Check the weather before you go, and be prepared to take jacket or a blanket with you. The air cools off quickly here once the sun goes down. While I’m not necessarily a golf enthusiast (I just enjoy riding around on the cart), Bully Pulpit Golf Course was a delight to the senses. 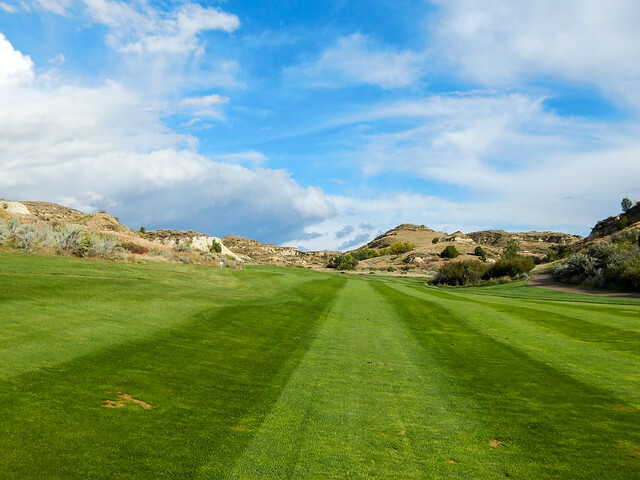 Nestled within the buttes of the Badlands, the course offers a spectacular tour of the area’s rugged terrain. The scents of sage and cut grass linger in the air, and well-aged trees with knotted bark line the greens. The course is beautifully maintained and I took as many, if not more, photos there as I did at the national park. If you want a tee-time, you may want to call ahead to be sure there’s not a tournament going on the day you plan to be there. I explored Bully Pulpit on an early September day that happened to be quite cold for me. As with anything else you plan to do in Medora, check the weather and be prepared. I’ve stayed three times at the Rough Riders Hotel and it has never let me down. The hotel is very comfortable, offers an on-site restaurant, and has Wi-Fi in the rooms. It has historic rooms available as well as more modern accommodations and even conference rooms for group meetings. Other, less costly options are available, including a few other hotels, cabins, and even camping for the more adventurous. 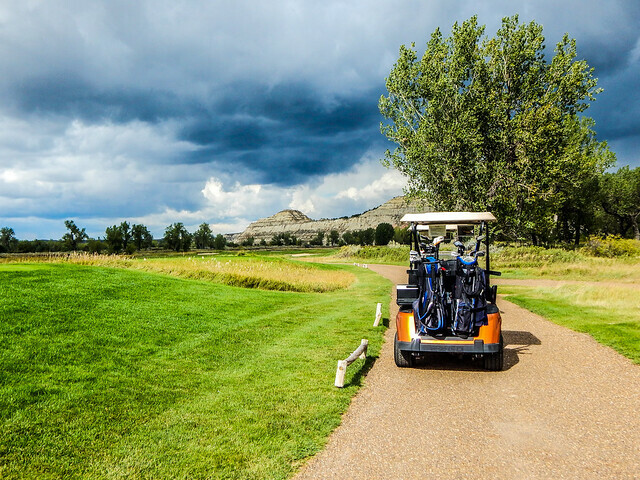 There are plenty of other things in Medora for people of all ages to enjoy. It’s truly a location for the whole family, or like myself, for adults traveling without kids. There are plenty of places in town to visit. Many of the people who work throughout the town are there just for the summer tourist season. They love to talk to the visitors about where they came from and what they think of the town. The laid-back pace here is difficult for me, and I have to remind myself that I purposely left the hustle-and-bustle of my daily life back home so I could relax and enjoy the friendly conversation with interesting strangers. 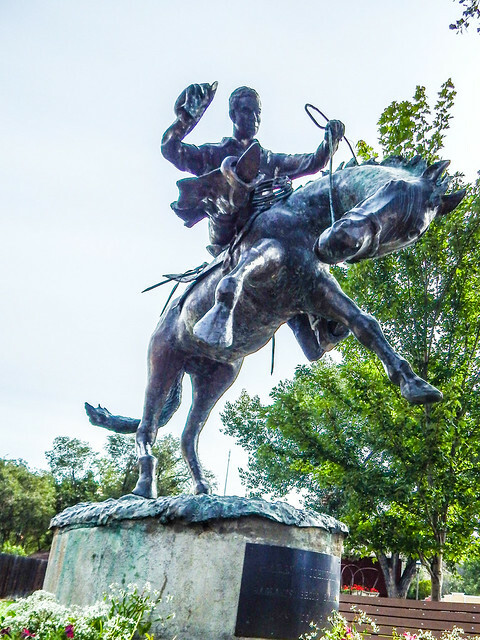 The town is home to the North Dakota Cowboy Hall of Fame. 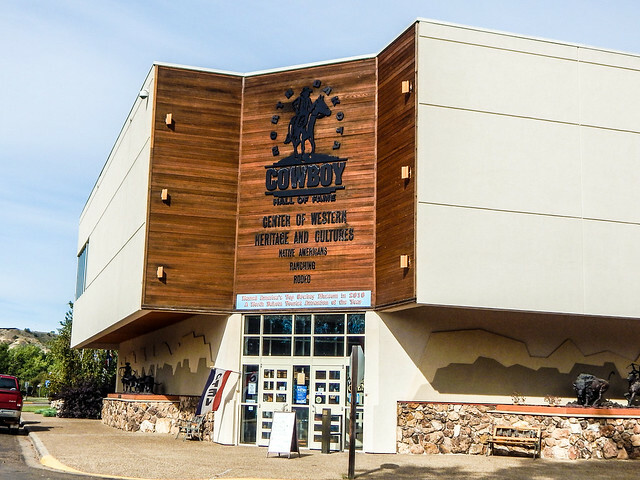 The interpretive center gives an up close look at western heritage and culture, and explores the history of the American cowboy. 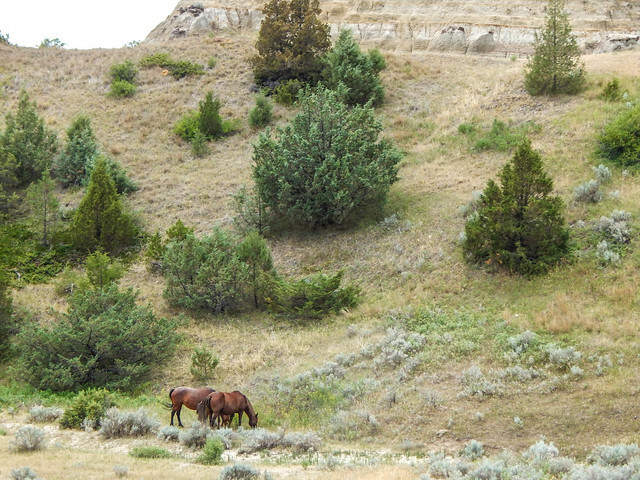 Visitors can also experience a bit of the lifestyle for themselves with one of Medora’s guided horseback trail rides or a western carriage ride. For those who like to push themselves, there are hiking and bicycling paths available as well. 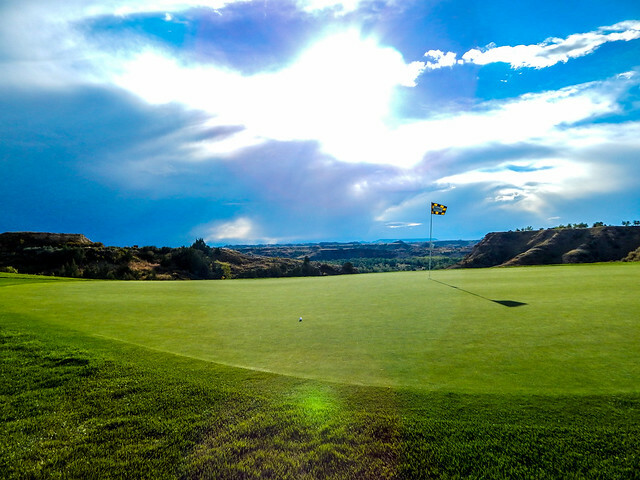 Despite the cold on the golf course in September, it’s often quite warm in Medora during the summer. For me, that’s a perfect excuse to stop in at the local ice cream shop for a scoop before heading out of the quiet, beautiful, historic town and back to reality. 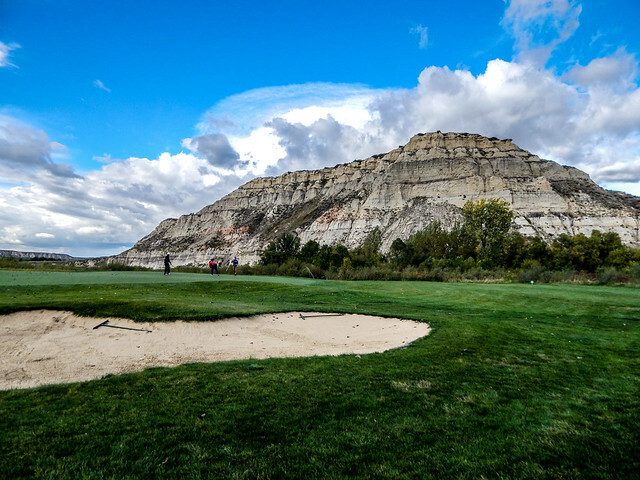 A final tip: Medora is a summer spot, with many of the attractions only open from May to September. Even in the summer, check the weather report often and be sure to be prepared for just about anything. Very interesting! 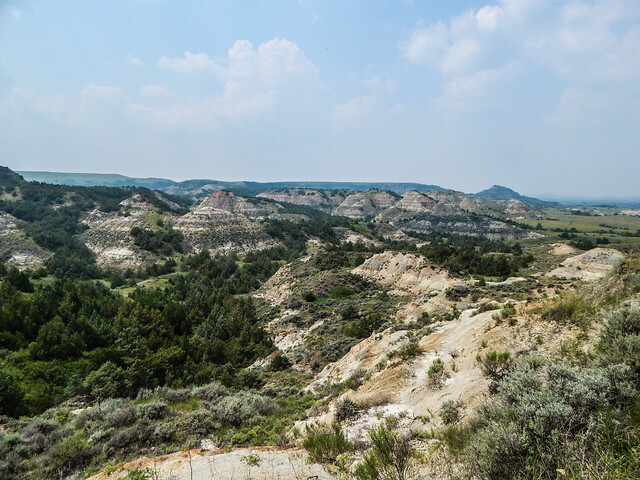 While I am a big fan of Theodore Roosevelt and have read a lot about him and his time in Medora, I never thought of the Dakotas as anything more than flatlands, except arround the Black HIlls. Thanks for the education! I look forward to seeing it myself one day soon.